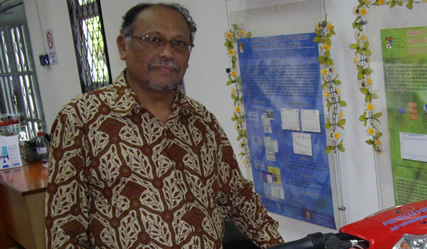 BANGI, 21 May 2012 – Director of Fuel Cell Institute at The National University of Malaysia (UKM), Prof Ir Dr Wan Ramli Wan Daud has been appointed a Fellow of the Academy of Sciences Malaysia (ASM). A statement from ASM today said the appointment was made at its 17th AGM on 28 April 2012. A conferment ceremony will be held to commemorate the appointment on a date to be decided. Prof Wan Ramli pioneered fuel cell technology studies at UKM with the hope of producing indigenous fuel cells and hydrogen energy technology. He is currently also Professor of Chemical Engineering at the Department of Chemical & Process Engineering, Faculty of Engineering since 1996.